An Amazon WiFi and Bluetooth wireless smart speaker system with informative display and the Alexa digital assistant. Stereo analog audio input Stereo analog audio input Has a standard 3.5mm jack for a two-channel analog audio input connection from another device such as a smartphone, tablet, etc. Stereo analog audio output Stereo analog audio output Has a standard 3.5mm jack for a two-channel analog audio output connection to another device such as a sound bar, speaker or home theater receiver. USB port USB port USB port lets you connect a flash drive for multimedia playback such as music or photos and can supply power to charge mobile devices. Other connections Other connections Other connections not mentioned above. Micro USB service port (under removable base cover). 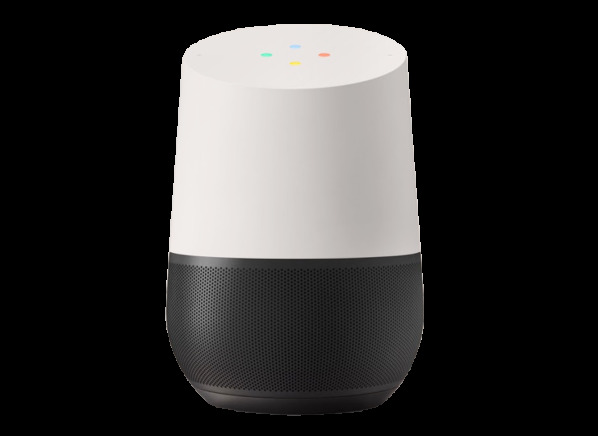 Supports voice identity Supports voice identity Natively supports the ability to differentiate and identify the individual making commands of the digital assistant after their voice has been trained into the account. A feature which allows the account holder access with their "voice print" to access personal information. Optional multi-room sharing Optional multi-room sharing Can be used as one of many speakers in a multi-room speaker set up that allows audio to be streamed wirelessly via a WiFi network to different rooms. Adjustable tone settings Adjustable tone settings Indicates if system has bass and treble controls, selectable pre-set tone settings, or graphic equalizer controls that can be used to adjust the speaker's tonal balance to improve tonal accuracy and/or suit personal preference. Speaker phone w/built-in mic Speaker phone w/built-in mic Can be used as speakerphone speaker when paired via Bluetooth to a smartphone. Calling Calling Supports voice-initiated commands to make calls using the stored contacts list. Texting Texting Supports voice-initiated commands to send texts using the stored contacts list. Messaging Messaging Supports voice-initiated commands to send messages and/or video messaging within the digital assistant's ecosystem using the stored contacts list. Accessories Accessories Additional items found in the box. Power supply and quick start guide. Warranty (mos. ): parts/labor Warranty (mos. ): parts/labor Warranty is for parts and labor, in months. Audio format Audio format "Mono" systems provide audio information from a single speaker array in one enclosure. "Stereo" systems provide two channels of audio information either as two separate speaker arrays in two separate enclosures, or as two separate speaker arrays that are both housed in one enclosure. Wireless type Wireless type The type of wireless technology used. Bluetooth works from device to device over a relatively short distance; it is well suited for wireless connections between devices in the same room. WiFi works from devices to device using an existing WiFi network; it's range is the range of the network and it is well suited for wireless connections between devices in different rooms of a house. Claimed battery life (hrs.) Claimed battery life The manufacturers claimed battery life of this product in hours. Dimensions HxWxD (in.) Dimensions HxWxD The height, width, and depth of the system, in inches. Weight (lbs.) Weight Weight is measured in pounds.